The orbit is a little lopsided and a little higher than necessary, but for my 2nd orbit ever I'm pretty pleased. Nice. Now work on getting multiple satellites up in a coverage cluster. Ugh I need more memory. B9, KW, FAR and deadly reentry together total almost 400meg of files, which is not much less than the 650meg all the other mod parts take up already. I don't know if I can add them. Whats needed is a 64bit version of KSP. Thats my current limitation. I love extraplanetary launchpads. A 10t hexcan of metal and some rocketparts hexcans have bootstrapped a part builder station module, a construction tug, a survey/science probe, and a group of 3 comsats with a ferry. Feels good replacing my first relay cluster attempt with a group of 3 comsats spread out into a 700km orbit. No more communication blackouts for me. I find that with KW Rocketry extraplanetary launchpad orbital stations are useless. KW can put anything into orbit if you try hard enough. How can I know when to launch a rocket to rendezvous with something in orbit, for example a lander to the command ship, or a supply ship to a space station? Is there some trick? Well sure, but cutting your launch trips from KSC down to supply runs to low orbit is nice. Plus an orbital construction yard is just cool. Transfer orbits. Get into a different orbit then wait till the lower orbit one (which is going around the planet faster) catches up, then change orbit to be the same. Full career mode will change a lot. I assume they're giving resources a price, and that will determine whether shipping and processing EPL ore/metal/parts and building a ship in orbit is cheaper than a KSC launch of the same ship. I do hope they add resource buying/selling and storage at KSC, with recovery of a ship adding the resources to the storage. It would give mods the ability to add commercial exploitation of offworld resources and allow frugal players to maximize their cash reserves with recycle friendly vessel designs (less castoff, more efficient fuel usage, ect...). An incentive to build reusable spacecraft would be cool. Imagine having to remember to put parachutes on your solid boosters to be able to afford the resupply mission for the space station you're launching! Thats when I'll get really into KSP again! The next couple KSP updates look really nice. With .24 is finishing career mode and .25 (hopefully) adding multiplayer, KSP is going to be a lot more fun. Till then, I'mma work on my off planet vessel creation/fueling rigs and learn to make plugins. If they don't add KSC resource inventory then I could probably make it myself. My rocket wasn't big enough and Jebidiah was killed. Your first of many kills. In other news, I just tossed those huge part mods into my install and I am about to start the game up. This should be interesting. I hate building, testing, and balancing a drone controlled crew ferry to get kerbals and some life support supplies up to my space station just to find out I forgot to fill the crew can. On the plus side the extra trips up have provided a bunch of spare fuel and a lot of extra tonnage for the rocketpart recycler. Built a science lab out of the last ship. I was so close to my first mun landing. This is my ship just before I accidentally slammed it into the surface. I feel for you. Same thing happened to me. Many times. With manned craft. I started career mode. It's fun to have limited parts. I recently finished the Tech Tree. 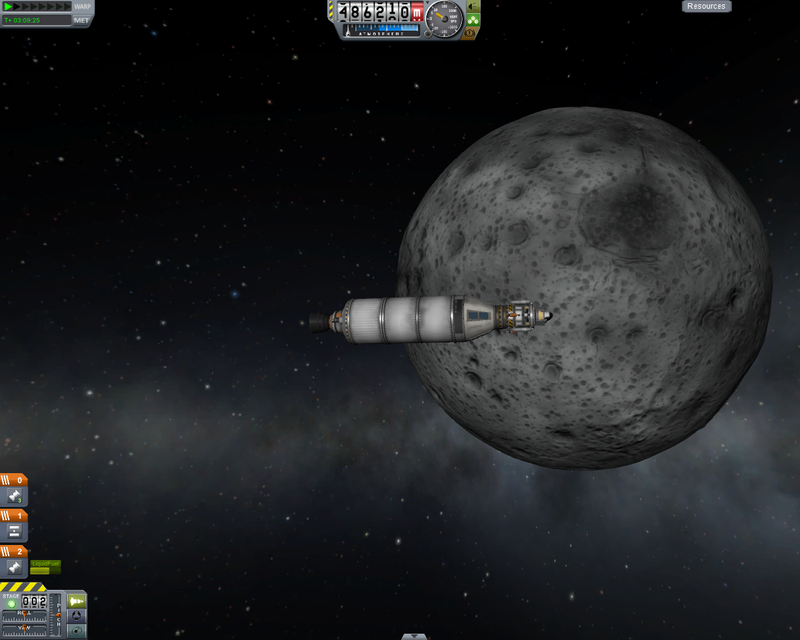 The only things I have left to land on are Tylo, Bop, Pol, Dres, and Moho. I landed on Eeloo last weekend. Sadly, Sigly Kerman is stuck at Eve's North Pole after an aerobrake that turned into an aerobreak. You win the pun of the day. I must say I play the game often and still (using the nasa mission parts) keep crashing my planes, note my latest is very low power. Here's an idea- are cruise missile-type vehicles a thing?